Well what a privilege to be able to fish a beautiful section of the river Lyd in the grounds of a gorgeous Elizabethan estate. 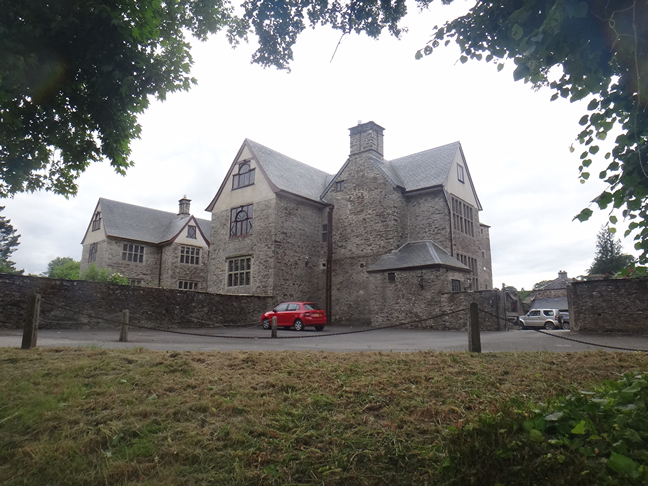 The manor house, build between 1600 and 1612 and incorporating an older structure at that time, is really quite something to see, a spectacular relic of times past. It is a designated as a grade 1 listed building and lies within an estate of some 1200 acres. 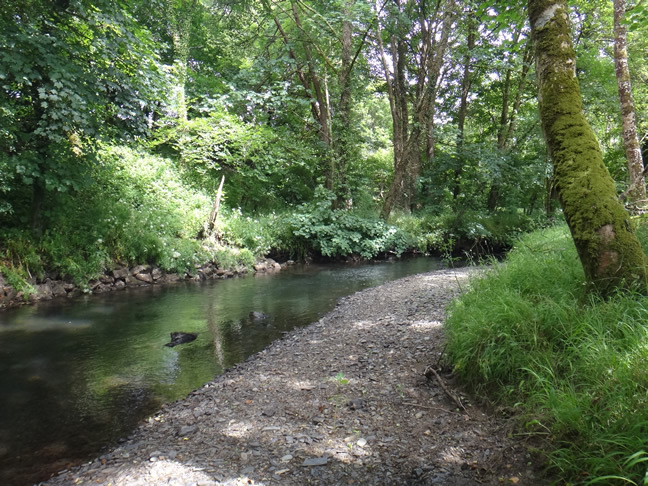 The river here is a little more open than sections of the Fal and Tressilian Rivers fished previously, but not by a large margin. Sideways horizontal casting still being the order of the day. This beat used up four of my tokens, double that required for the previous beats fished but it doesn’t matter, I am off to Wales tomorrow and the remaining tokens in my book of ten will go unused. I was therefore more than happy to “burn” four in one go on this section. Sadly the water didn’t live up to expectations, in that I only caught very small fish, perhaps 25 odd of them but it was still a joy to explore and one could easily see the potential. One spectacular part of the day was the appearance of Ephemera Danica hatching; after nearly 45 years of fly fishing I have never actually seen one of these insects in the flesh. Actually I am not sure that I have ever fished water that contained them before yesterday. Ephemera Danica, my first ever “in the flesh encounter”. The guide book did suggest that there was a reasonable population of these insects on the Lyd, but I hadn’t really expected to see them. Being used to fishing #20 Midges most of the time back home these massive insects seem somewhat incongruous , they rise up and flutter over the water like miniature angels, the sunlight catching their wings as they head for the bankside vegetation for their final moult. They are most intriguing bugs, not that all the ephemeroptera are are not, but these large insects may live in the silt for up to three years as nymphs, before enjoying a brief adulthood of only days. I was captivated watching them, the speed with which they manage to extricate themselves from the nymphal shuck and the instant ability to fly, no matter that they have never encountered air before. There is much in nature that fascinates me but if there was anything going to convince me of the existence of a higher power; watching mayflies hatch from the surface of a stream would be a pretty compelling example. 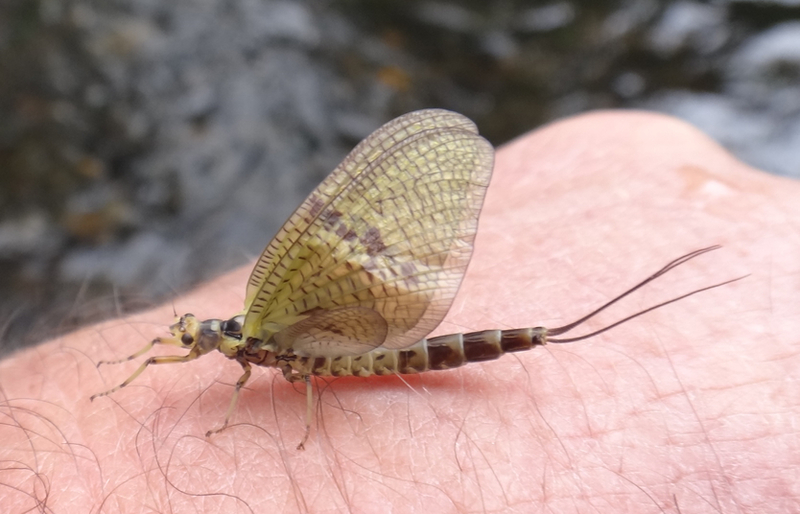 I had thought that the large mayflies would perhaps bring up some bigger fish to the surface but that didn’t prove to be the case and I fished a double rig of a large parachute mayfly and a diminutive #18 midge pattern and was probably equally successful with each fly. The tiny trout, despite some impressive acrobatics, often failed to get hold of the larger fly. In fact they frequently missed in their attempts to grab the real mayflies as well. I do wonder if perhaps , had I stayed later on the water, I may have moved some larger trout but I had an arrangement to meet up with old friends and had to head home earlier than I otherwise might have. I did try out my new waders this time as the weather was looking a little dodgy when I started fishing and although the water wasn’t that cold the advantage of the built in gravel guards can’t go unmentioned. Up until now I was near crippled by stones in my boots come day’s end. It is hard to stop and clear them out when there is fishing to be done, I doubt I am the first person to make that mistake. So all in all a good day, pleasant countryside and a lovely drive out to the water, followed by scampi and chips at the Bredon Arms in Bude with some good friends. The drive to Sydenham had taken me through the town of Lifton and past the door of the famous fishing hotel “The Arundel Arms”. It was here, some 44 years back that I had my first and pretty much only ever proper fly fishing tuition, on a course for beginners. I remember thinking at the time that I didn’t need all the casting tuition and was simply keen to fish some different waters. Since that time I have re-engineered my casting four or five times and learned a lot more about it than I ever knew possible when I was a teenager. I suppose the enthusiastic, if somewhat egotistical, confidence of youth isn’t all bad and those early days were the starting point of what has been a lifetime love affair with fly fishing. An obsession I suppose which ultimately has lead me back here some four decades later, still trying to quench an insatiable thirst for more fish. I would like to think that I am a little better versed in things piscatorial these days, perhaps better prepared and more inclined to see the beauty of my surroundings rather than just the fish. But truth be told, that boyish glee at casting a fly over new waters hasn’t ever really diminished and I look forward to the next stage of my trip with the same excitement that I once felt heading out for my very first dedicated fly fishing weekend in Lifton. So this part of the trip ends and I was pleased to get in more fishing than I had thought or planned really. I have caught a bass or two in Falmouth and managed to land at least a couple of trout on all the beats attempted so far. Tomorrow I head for the Welsh Wye and the Usk and hopefully the little bit of practice enjoyed down here in the South will stand me in good stead when I hit ,what should hopefully prove to be, more productive waters. This entry was posted on June 16, 2018 at 12:04 pm and is filed under Fishing. You can follow any responses to this entry through the RSS 2.0 feed. You can leave a response, or trackback from your own site. Thank you Tim for some fantastic writing and images. I would have liked to see the furniture in the house! Keep the reports coming.